What would be a training centre without one. Ours can comfortably seat up to sixteen students and has the flexibility to allow us a number of seating plans so that we can adapt it to the best lay out to suite the instruction being given. 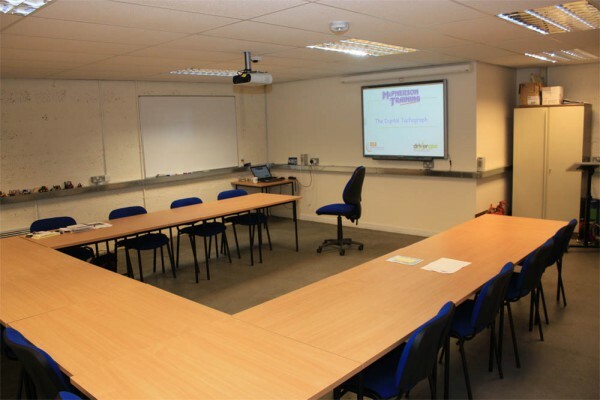 As well TV/DVD facility it is also fitted with a whiteboard and modern magi board screen driven from a laptop allowing presentation of power point displays and use of the latest technology. A small rest area is provided outside the classroom fitted with comfortable chairs and the facilities for a cup of coffee or tea. As well as being the area where we welcome our students and visitors it acts as a focus for interaction with trainers on a less formal basis. This area allows us to conduct forklift training indoors so that it can be completed in inclement weather. It is fitted with a range of racking and a range of palletised loads to allow realistic training. All training is accredited by RTITB and leads to registration on the National Operators Register. External to the building we have a driving instruction and test area, which replicates the requirements of a LGV test area for the off road manoeuvring exercises. In deed, we are now accredited with the Drivers Standards Agency so that trainees can now be tested on the same area that they have learnt on which helps remove some of the anxiety and while waiting for their test they have use of the rest area facility mentioned above, so they can wait in comfort with a calming brew. These allow hands on training off vehicle so any problems do not get recorded on driver’s cards or operator’s vehicles. These simulators are further supported by on screen simulators so demonstrations by instructors are clear to all trainees. This is more a training rig than a pure simulator, however it allows hands on experience for those about to take module 4 LGV exams with a range of securing devises from simple rope and dolly knot to cargo bars, lashing straps and chains. Students are again examined by DVSA on the same in-house devise giving greater confidence.